15-YEAR FOLLOW-UP OF THE NORDIC MCL2-TRIAL: DESPITE LONG-TERM RESPONSES LATE RELAPSES STILL OCCUR. Until recently, Mantle Cell Lymphoma (MCL) was associated with an exceedingly poor prognosis with a median overall survival (OS) of 3-5 years (Herrmann, JCO, 2008). However, during the last 15 years the outcome has improved substantially by an intensified Ara-C-containing induction regimen, addition of rituximab and consolidation with high-dose therapy and autologous stem cell transplantation (ASCT). One such regimen was introduced by the MCL2 trial, conducted by the Nordic Lymphoma Group (NLG), and showed a projected 10-year OS and PFS of 58% and 43%, respectively, after a median follow-up time of 6.5 years (Geisler, BJH, 2012). The MCL2 regimen is still the 1-st-line regimen of choice for younger patients in many centers worldwide. Here we present the updated results after a median follow-up of 11.4 years of the MCL2 trial. Patients: Between 2000 and 2006, 160 untreated stage II-IV MCL patients younger than 66 years were enrolled in Denmark, Norway, Sweden and Finland. Patient characteristics have previously been described elsewhere (Geisler, Blood, 2008). Histological diagnoses were confirmed by a central pathology review board. An informed consent was obtained from all patients.Treatment: Six alternating cycles of maxi-CHOP and high-dose Ara-C, with rituximab after cycle 3, followed by BEAM/BEAC and ASCT in responders (n=145). Patients who subsequently developed solely molecular relapse detected by clonal IGHV or t(11;14) PCR received 4 weekly cycles of rituximab (Andersen, JCO, 2009). With a median follow-up of 11.4 years, the median OS and PFS were 12.7 and 8.5 years, respectively (fig.1a,b). The median response duration (RD) of the 145 patients who underwent ASCT was 12.4 years (fig.1c). The MCL international prognostic index (MIPI) and the biological index (MIPI-B) significantly divided patients into three risk groups according to OS, PFS and RD (fig.1d,e, data only shown for PFS). The median OS and PFS were 4.0 and 2.5 years in the MIPI high-risk group, 11.0 and 8.0 years in the intermediate risk group, and not reached and 12.8 years in low risk group, (fig.1d). Interestingly, 17 patients relapsed after 5 years or more in CR, and 6 patients beyond 10 years, primarily from the intermediate and low risk groups. Meanwhile, the MIPI high risk group reached a plateau at 24% (n=9) after 7 years. 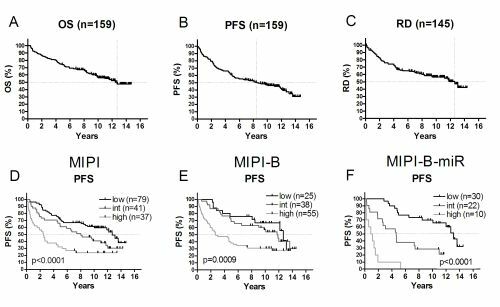 We recently proposed an improved prognosticator including expression of micro-RNA-18b (MIPI-B-miR) based on the same patient cohort (Husby, Blood, 2016). In the present update, it remains highly significant and identifies a high-risk group of an exceedingly poor prognosis with OS and PFS of only 1.6 and 1.0 years, respectively (n=10) (fig.1f), while still separating the low- and intermediate risk groups. After an extended median follow-up of 11.4 years, the outcome of the Nordic MCL2 trial is still good. However, a pattern of continuing relapse is observed, seemingly precluding cure. MIPI, MIPI-B and, in particular, MIPI-B-miR remain valid prognosticators that clearly separate patients into risk groups with different outcomes. All risk groups might benefit from addition of novel agents, and such approaches are underway in large randomized trials.